KCBA Fox 35 – Monterey / Salinas » Residents wake up to a rare sighting in the Bay Area: Snow! 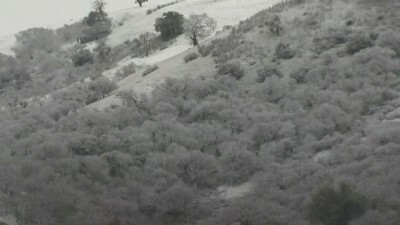 OAKLAND, Calif. (KTVU) - Bay Area residents woke up to a strange sight on Tuesday: Snow. The powdery white stuff was spotted at higher elevations in the Santa Cruz Mountains, Mount Tamalpais in Marin County and the Altamont Pass in Livermore. Snow also fell on Mount St. Helena in the North Bay, Mount Diablo in the East Bay and Mount Hamilton and Mount Umunhum in the South Bay. Skyline Boulevard in San Mateo County was also speckled with snow, the San Mateo County Sheriff tweeted. Page Mill Road in Palo Alto also saw snow. The National Weather Service issued a winter weather advisory for parts of the Bay Area through 7 a.m.
Driving conditions were rough, especially on mountain roads and passes. Earlier on Tuesday, the California Highway Patrol shut down Highway 17 between Santa Clara and Santa Cruz counties because of snow. A turnout off Highway 17 just South of Redwood Estates in Los Gatos became the go to spot for snowball fights and selfies Tuesday morning. Middle school teacher Alison Applebee had to prove it to colleagues and students. She packed a cooler full of snowballs to take to class. Feb. 5 has historically been a good day for snowfall in San Francisco. On Feb. 5 1887, 3.7 inches fell during the day – up to 7 inches on Twin Peaks and 5 inches in the downtown area. Wednesday’s weather is expected to be even colder.